There’s an old joke about sticking politicians’ faces on postage stamps – the problem is it can encourage people to spit on the wrong side. Not only that, there’s a reasonable chance that for every person who is happy to see the face of a particular party leader drop through their letterbox, there’ll be at least another two wholly enraged that the honour of postage stamp immortality has been bestowed on them. Politicians, by their very nature, split opinion. It’s why so few of them are used in advertising campaigns. It’s the quickest way for a brand to go out of business. Donald Trump is a case in point. One of the most divisive figures on the planet, it would appear unlikely that he would be good subject matter for stamps. Certainly the US Postal Service hasn’t rushed to capture the 58th President of the USA in inch-square form. Although it did release a 58th Presidential Inauguration commemorative envelope featuring Trump and second in command Mike Pence. This, however, is simply tradition, an honour bestowed on all presidents. And every time the envelope is marked by the addition of a simple stamp featuring the US flag. Trump, however, despite his claims to the contrary, can be licked. His image has cropped up several times on the stamps of other countries. Liberia, for instance, has a tradition of celebrating incoming US presidents in stamp form. Dijbouti, Sierra Leone, and the Central African Republic also commemorated Trump’s election as president. What Trump’s view is of these countries is unclear. If Trump does ever make it on to a US postage stamp, chances are he won’t be around to see it. The US Postal Service has a habit of commemorating the nation’s leaders when they’ve departed to that big White House in the sky. John F Kennedy, Richard Nixon, Gerald Ford, and Ronald Reagan have all been captured for posterity. And, naturally, George Washington. 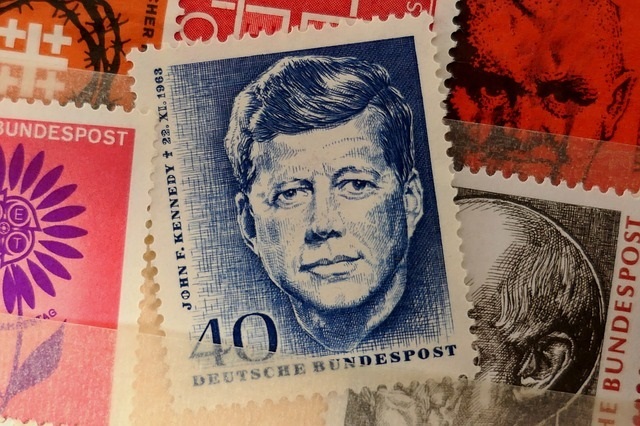 Want to find out more about stamps featuring world leaders and their value? Head to www.tonylester.co.uk.